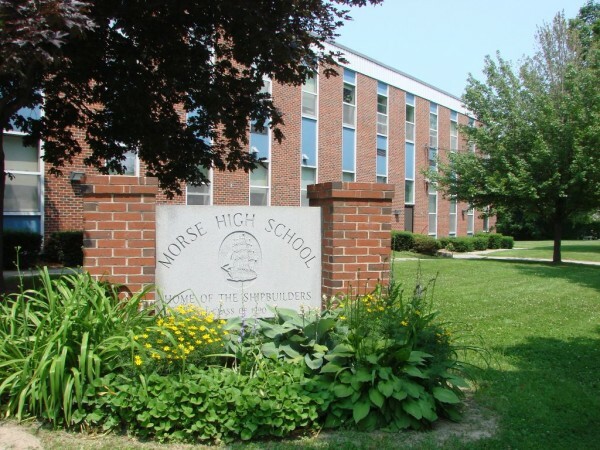 The Regional School Unit 1 Board of Directors voted unanimously Monday, Oct. 26, to rebuild Morse High School at a new location. The decision reflects a show-of-hands vote at a public forum Oct. 7, which indicated overwhelming support for the rebuild. The School Board was already leaning in that direction in its discussion Sept. 28. There was no board discussion at Monday’s meeting prior to the vote, Chairman Tim Harkins said Tuesday. The decision followed a study this summer that determined the existing High Street school is not suitable for renovation or expansion. The study of both the nearly nine decades-old school and the Bath Regional Career and Technical Center, was prepared by Fay, Spofford & Thorndike, a South Portland engineering company. The study also noted that Morse’s footprint of about 124,000 square feet, plus the technical center’s nearly 43,000 square feet, have a total of about 167,000 square feet. But the two facilities need more than 200,000 square feet. For Morse to have the land it needs, several surrounding properties would have to be purchased, and not all the owners are interested in selling, according to Ron Lamarre of Lavallee Brensinger Architects of Manchester, New Hampshire, which RSU 1 hired to provide architectural and engineering services for the project. RSU 1 has been exploring sites near Bath Middle School and at Wing Farm Park. A nonbinding community straw vote fon a new school at a specified site is No. 6 of a 21-step major capital school construction process. Building a new school could take two years, while renovation could span four or five and be less economical, Lamarre has said, noting that a new school could be complete in 2019 or 2020.